What is DA Form 759-2? DA Form 759-2, Individual Flight Records and Flight Certificate - Army (Flying Hours Work Sheet) is a form that serves as a record of an aviator's flight hours. It can be used as both a temporary worksheet or a consolidation worksheet for flights performed by an RCM/NRCM and Aviation Career Incentive Pay (ACIP) recipients. The latest version of the form - sometimes incorrectly referred to as the DD Form 759-2 - was released by the Department of the Army (DA) in July 2018 with all previous editions being obsolete. An up-to-date DA Form 759-2 fillable version is available for digital filing and download below or can be found through the Army Publishing Directorate website. The certificate allows recording three types of aircraft, flight simulators, and seat designations within three pre-arranged sections (A, B and C). If more than three different aircrafts or flight simulators are used during an annual period, an additional DA 759-2 is used as a temporary worksheet. How To Fill Out Da Form 759-2? For use of this form, see TC 3-04.8; the proponent agency is TRADOC. The soldier's full name (with middle initial) is recorded in Block 1. Their military rank, DAC, CIV or CTR is entered in Block 2. The covered period is specified in Block 3. The aircraft mission, design, type, and series of a flight simulator, as well as the seat designation, is entered in Sections A, B, and C.
Column A is for recording the months and days of each flight. Column B requires the duty symbol for each line. Column C requires a symbol for every flight condition. Column D is for only for the mission symbols containing a C for combat or a D for imminent danger. Column E is for the hours and tenths of hours for each individual entry from DA Form 2408-12. Flights with the same date, duty symbol, flight condition, and mission symbol may be consolidated into one entry for only for the flights performed in a single day. DA Form 759, Individual Flight Record and Flight Crew Certificate - Army (Flight Hours) is a form used for closing out flight records. DA Form 759-1, Individual Flight Record and Flight Certificate - Army (Aircraft Closeout) is used for recording flight time by flying duty and condition during the closeout period for each aircraft flown by an individual. DA Form 759-3, Individual Flight Records and Flight Certificate - Army (Flight Pay Work Sheet) is a form used for keeping flight records in order to determine flight pay. DA Form 2408-12, Army Aviators Flight Records is a form required to be completed after every performed flight. 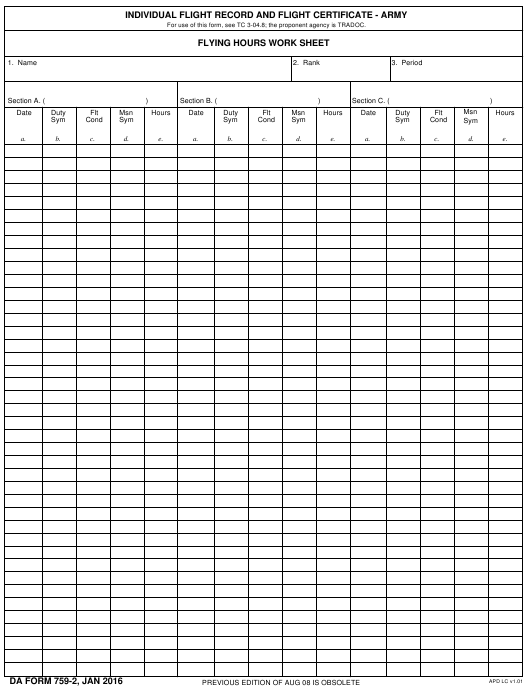 At closeout, all flight record forms for every individual are arranged in the DA Form 3513, Individual Flight Records Folder, United States Army.